My sincerest apologies for not writing sooner -- it has been a packed week. I am now writing from Washington, D.C., as I arrived late Monday night. The past two weeks have been nothing short of exhausting, enlightening and enthralling, and I would like to share the past few days of my trip as well as some reflections with you. I flew to Astana Wednesday morning and returned to Almaty on the overnight Talgo train Friday night. while the plane is a quick 90-minute trip, I just love taking the train in Central Asia. It is such a cultural experience sharing a sleeping space with others for 12-hours. Plus, the prices are fairly comprable. 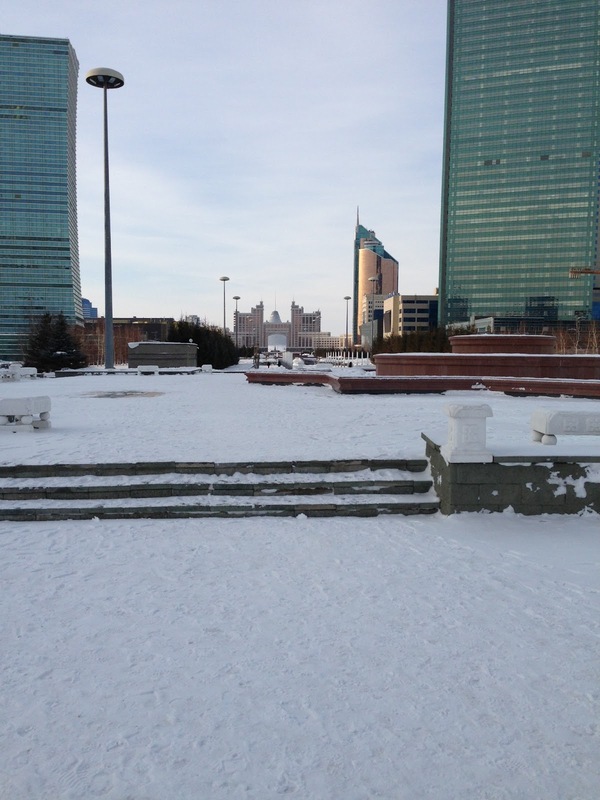 While I did not have any meetings in Astana on Wednesday, I took the time to walk around for a bit in the FREEZING temperatures. I was warned that Astana is cold. A few weeks ago it was -40 (Celcius). Fortunately, it was not that cold when I was there. But the below zero temperatures combined with the steppe rends prompt everyone to stay inside. 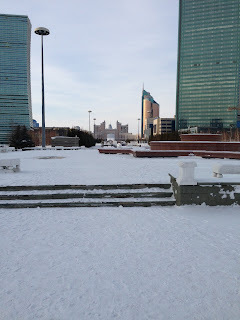 Here are some pictures of the capital under snow (to compare, look at the pictures from my post in August 2011 on Astana). The streets were empty, as everyone stays inside to avoid the cold. The city is however, no less majestic under a foot of snow. There were even more buildings under construction and new structures already built. As one cab driver commented, "there's always something being built." The quality, on the other hand, is questionable. Companies come, quickly build something, reap a profit, and then leave. I rented an apartment during my time in Astana, for example, and the wood on the door and frame was poorly cut, making it impossible to close (the "inside" door, not the hallway door with the locks. Those of you who live in the countries in the former Soviet Union know what I am talking about). Later Wednesday night, I met up with my friend Mira for dinner at the Khan-Shatyr shopping mall. Mira is a native of Kostenay who went to school in Almaty and now works in Astana. We met when I was in Kazakhstan summer 2011 and it was so great to catch up with her. Mira also spent a year working in New Jersey on the "work and travel" program, so we always share some laughs over the Garden State. Here is a picture of the Khan Shatyr under the holiday spirit. 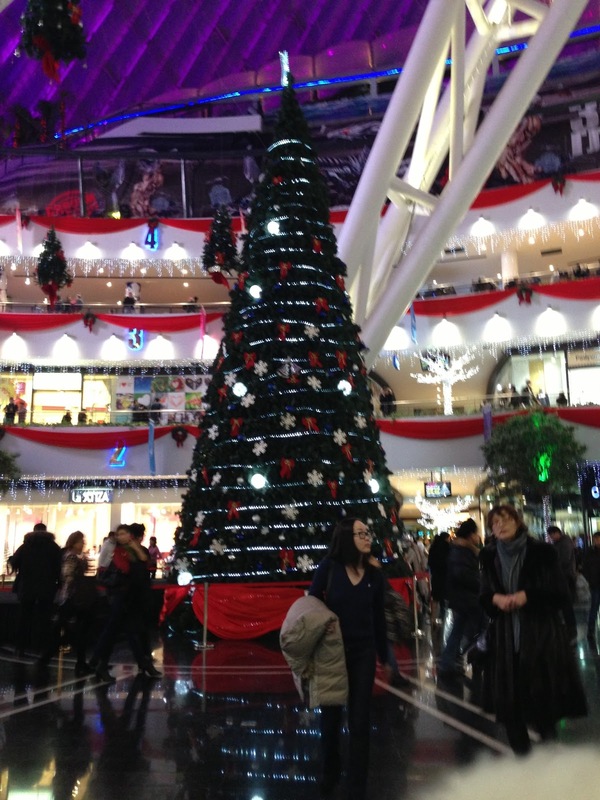 Christmas Tree in the Xan-Shatyr. I spent all day Thursday in the U.S. Embassy in Astana conducting interviews with some Embassy officials for my research on Kazakhstan's denuclearization. I also had some conference calls in Russian with Kazakhstanis in other parts of the country. It was an exhausting and enlightening day and I have to give a huge thank you to the Embassy, particularly the local staff, for assisting me. The Embassy is next to the new Mosque, Pyramid and Palace of Independence, so I took the opportunity to visit the later two places after my interviews. It was great to see the tours once again and "update" my facts. 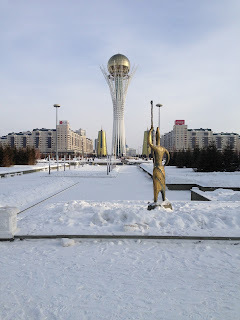 Given that Astana received the bid for the 2017 Expo, I was particularly interested to see how the development plans would alter the city's design. It turns out, the Expo will be on the outskirts of the city, so there are no major alterations to the existing model on display at the top of the Palace of Independence. My interview for Friday unfortunately fell through. It happens! So I had the day to explore Astana. I have already visited all of the museums and wanted to see something new. 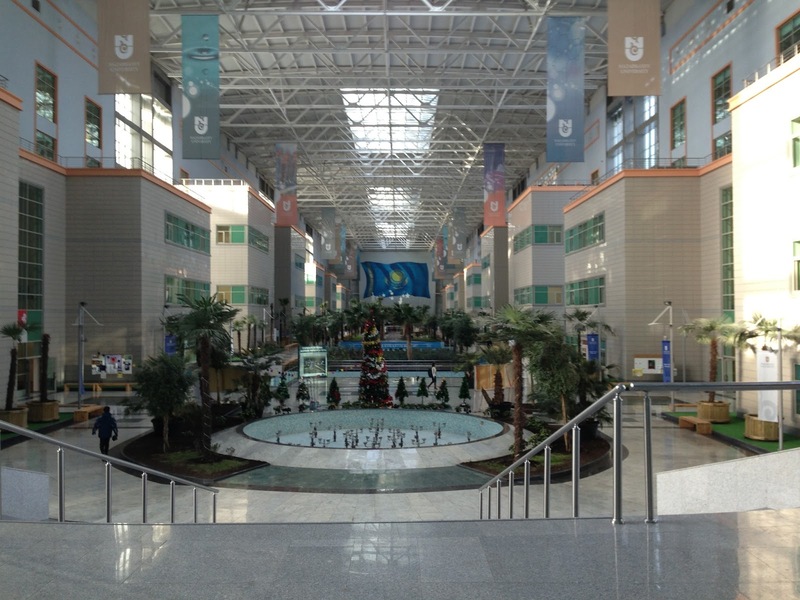 I ended up visiting Mira during her lunch break at Nazarbayev University and chatting with her colleagues. To get there, I took a cab and had a fabulous conversation with the cab driver. Now, cabs in Kazakhstan are really people who informally drive around and transport people from point A to point B for a negotiated price. I absolutely love taking gypsy cabs and always have memorable, insightful and sometimes hilarious conversations with the drivers. As all of my conversations with cabs begin, they ask me where I am from. I tell them America, and then they ask what my ethnicity use, usually suspecting that I am Turkish, Georgian, Armenian or Iranian. I tell them Russian, and they look confused. Then they ask how old I am, if I am married, why I am in Kazakhstan, etc. This driver was particularly hysterical. He asked for my views on Obama, Putin and Nazarbayev. I of course say they are all good Presidents. The driver, about 60 years old, commented "Yes, Putin's a strong President." When I told him I had been to Russia he comments, "Russia's a strong country. Putin's a strong President. No one would mess with Russia." I found these comments particularly interesting, as they reveal that one legacy of Soviet rule is the continued perception of Russia as a strong power. As I reflect on my experiences in both countries, which I confess are limited, it is hard for me to conclusively determine whether Russia is "stronger" than Kazakhstan. For an average citizen, I would argue that the rhythm, practices and behaviors of daily life is fairly comparable. To be truly honest, the countries are so, so different. Most scholars and political scientists continue to think of Russia and Central Asia, particularly all of the "stans" as a blanket, former-Soviet space. The reality is the opposite -- Central Asian countries and Russia are all different. Extremely different. And all of the "stans" are not the same. I so desperately want to travel throughout the other Central Asian republics to better elaborate on this last point. Nonetheless, Kazakhstan is rapidly changing. What's more, is that the urban-rural divide as well as daily societal interactions is increasingly marked by the Russian-Kazakh language. While everyone speaks Russian, Kazakh is increasingly popular. In fact, I realize I am a junior scholar, but I argue that Western academia underestimates the importance of Kazakh language in shaping Kazakhstani national identity and politics. During one of my interviews with a Kazakhstani politician, he commented "if you really want to know Kazakhstan, you must learn Kazakh." While I was in the library at the National Academy of Sciences, the librarian commented "the next time you come here, no one will speak Russian, everyone will speak Kazakh." When my friend picked me up from the airport, he and his mother chatted in Kazakh. Even on the streets, I hear more and more Kazakh. On TV, an American sitcom will have Kazakh audio and Russian subtitles. The President's New Years speech is first in Kazakh and then in Russian. My Kazakh visa form was in Kazakh and English, when a year and a half ago it was in Russian, Kazakh and English. Commercials and posters are in Kazakh and in Russian, with Kazakh appearing first. During one cab ride, I was in a car with a Kazakh driver and two Kazakh girls and they chatted in Kazakh. They asked me if I spoke Kazakh and I responded "joq" ("no" in Kazakh), and they said I should. My old host mother, a Kazakh-Russian translator, even commented how Kazakh is increasingly used in official documents. While Russian is important and will remain a widely-spoken and studied language, given the limited number of historical and current-day documents in Kazakh, Kazakh language is increasingly important. While Russian is useful for understanding "Kazakhstani" culture as it has been changed by Soviet rule and national politics since 1991, Kazakh is essential for understanding "Kazakh" culture and the micro-level dynamics that occur in the domestic, private space and in schools. Plus, the majority of rural inhabitants speak Kazakh. This means that the urban-rural income divide will also occur along ethno-linguistic lines. Watch this space. Alas, I just digressed from my time in Astana. So, my cab driver took me to Nazarbayev University (NU) and when we arrived at the gate and I didn't have an official NU identity card, he goes "She's an American." They let us in, and he goes, "see, no worries, you're an American, they'll of course let you in." All of the faculty are from Western countries so it was so bizarre for me to be in Astana and see white, Anglo-Saxon, middle-age men walking around speaking English. Hearing American English in the halls and in the cafeteria was also bizarre. At the same time, the NU building is quite new with state-of-the-art facilities. The main atrium features plants, as one woman was watering them. Given that it was -10 outside, this was an odd sight. I walked around NU for an hour, and then hung out with Mira and her co-workers for an hour and a half during their lunch break. 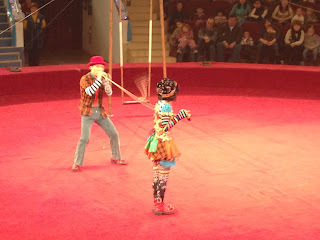 They were pretty interesting and lovely. 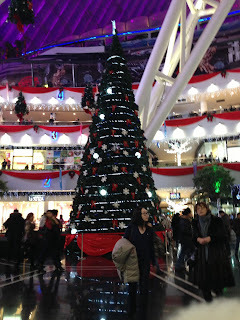 I later headed back to downtown Astana, checked out of my apartment, and went to the train station. 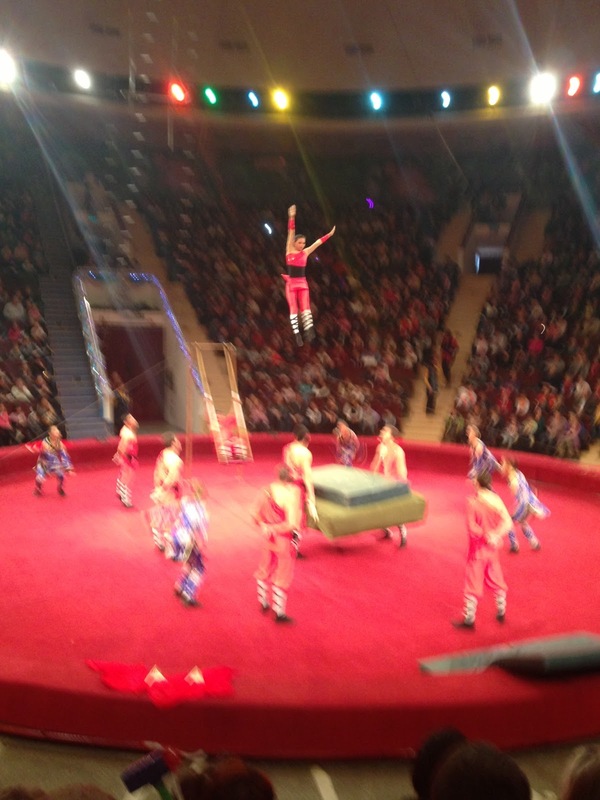 Saturday, I visited Murat and Karima, my friends in the Kazakh national circus. Karima had invited me to attend as a guest and I had a wonderful time. Thanks Karima and Murat! Karima and Murat performing at the Kazakh National Circus. Sunday morning I went to Arbat and bought a painting. I then spent the rest of Sunday at Dasha's apartment, as Dasha had gone home for the holiday weekend and I had to oversee a repair. I ended up chatting with Dasha's landlord, a 70-year old ethnic Russian woman who was born in Russia and moved to Almaty when she was 12, for some four hours while the repairs were being done. She was a living history book and shared some fabulous fun facts about Almaty's history. She told me about the changes to the city that have occurred since the revolution. For example, the older buildings on the outskirts of Zenkov Cathedral and Panfilov park used to be the residences and gymnasium of the officials in the Tsar's government. Today, only the gymnasium stands. I also learned the Russian word for "hot water pipe." Win-win. Alas, Sunday night I had tea with my Kazakh friends, before coming home and packing. It was great to catch up. 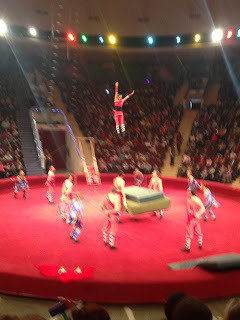 I wish I had more time to see four of my Kazakh friends, but it was a busy trip. Either way, on a personal note, it was great to see how our lives had changed over the past year and a half. While I started grad school, all three got married (ages 24, 25 and 28), one had a baby, and one is seven-months pregnant. I loved chatting with them about their lives and gaining insights into Kazakh traditions for lifecycle events. For example, in traditional Kazakh culture, the mother and child are left alone for 40 days after the birth. This is viewed as a critical bonding time for the mother and child. I had a 7:45 AM flight from Almaty on Monday morning. 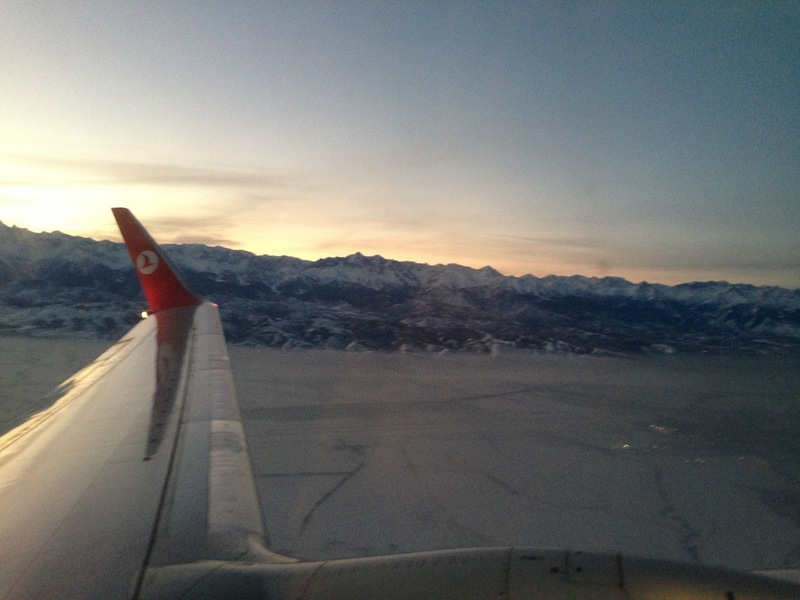 Every time I fly in and out of Almaty I always take in the view of the majestic Tian Shan mountains that overlook the city. The view never gets old --- enjoy! I arrived in DC late Monday night. My cab home from Dulles was significantly less exciting. Either way, it is always nice to come home after an eventful trip. Alas, those are some quick thoughts from the end of my journey, although more details and posts to come in the coming weeks, as I reflect on my research trip. For now, I am going to go do laundry, catch up on sleep and prepare for the semester that begins tomorrow. To all those who celebrate Eastern Orthodox Christmas, I wish you a happy holiday!